Nowadays, mushrooms are available year-round, but to me, they definitely taste best in fall. Their earthy flavor reminds me of rainy days, long hikes in the woods, and the scent of wet leaves. You can eat them raw in a salad, make mushroom soup, sauté them in garlic butter with some fresh herbs, stuff them, or grill them, but my favorite by far is to serve them in a cream sauce. Here, I combined them with savory meatballs, a delicious creamy white wine sauce, and fresh homemade pasta. This is a classic comfort food recipe that can easily be adapted depending on how much time you have and what’s in your fridge. For a quicker version, you could use dry or fresh store bought pasta and chicken breast instead of meatballs. If you want the full experience, also make your own fresh fettuccine. Cut the onion in quarters. Chop one quarter very fine, set the remaining 3/4 aside. In a large bowl, mix the finely chopped onion, beef, breadcrumbs, crushed or finely chopped garlic cloves, mustard, herbs, and spices until well combined. Shape the mixture into meatballs, about the size of large walnuts, set aside. 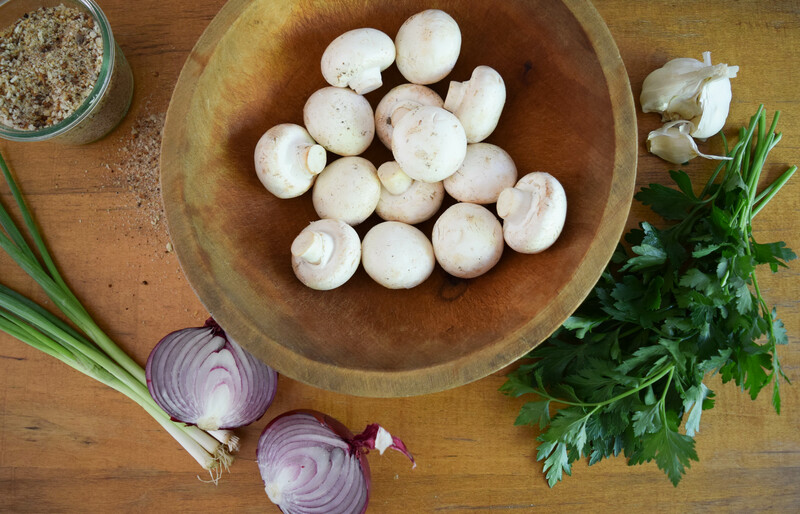 Clean the mushrooms and cut them into quarters. Chop the rest of the onion. Add about 1 tablespoon of vegetable oil. Fry the meatballs in batches (if you add too many at once, the temperature of the pan will be lowered too much and the meatballs will stick). They should get a nice sear on all sides, but be careful not to overcook them. Transfer cooked meatballs to a cooling rack or plate and set aside. If you need to add more vegetable oil between batches, add it from the side of the pan, so it is heated to the right temperature by the time it reaches the middle of the pan. Turn the temperature to medium. In the same pan, melt the butter and add the onion, crushed garlic, and mushrooms. Stirring occasionally, cook until the onions are translucent. Add the white wine, vegetable broth, cream, and a couple of twigs of fresh thyme. Bring to a boil and, stirring occasionally, let simmer until the sauce has thickened, about 15 minutes. In the meantime, bring a large pot of water to a boil, add about a teaspoon of salt. Cook the pasta. Add mustard to the sauce and season with salt and pepper. Transfer the meatballs back to the pan to reheat them in the sauce. When the pasta is cooked, add it to the pan and toss it in the sauce (if you are using fresh pasta, also add a little bit of the pasta water, as the noodles will absorb most of the sauce). To serve, sprinkle with fresh Italian parsley or green onions.